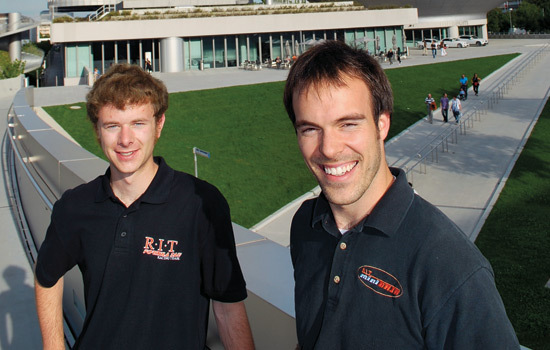 RIT engineering students Tim Monahan, left, and Joseph Featherall worked for BMW in Munich, Germany. When Joseph Featherall was in high school, he would spend hours drooling over BMW sports cars with his friend, whose father worked at a BMW dealership. In college, he also got to spend time with the cars but this time learning a different approach to engineering design as part of a co-op he just completed for the BMW Group in Munich, Germany. Manny Contomanolis, associate vice president and director of Cooperative Education and Career Services, says the global slowdown has affected the number of students interested in working abroad—not because companies aren’t interested in students but because students are concerned about the costs associated with living and working in another country. “We are working on trying to create an endowed fund to allow students to more easily travel abroad,” he says. By 2013, President Bill Destler’s goal is for about 200 students a year to work overseas. About 100 students are doing that now. Maria Richart, associate director for International Outreach Cooperative Education and Career Services, says many overseas companies like employing RIT students so much that they contact RIT directly for more. “Once these companies understand how smart our students are, they give them a lot of responsibility,” she says. Students are working all over the world, Richart says. Alvaro Prieto, a fifth-year electrical engineering student, spent the summer of 2009 in Zurich, Switzerland, working for the Paul Scherrer Institute and this past summer in Tampere, Finland, working for Tampere University of Technology. Tim Monahan, a fifth-year mechanical engineering student, also spent five months working for BMW this year. He worked on the adaptive cruise control, lane departure warning and parking assistant systems that help make driving safer and more comfortable. He got the idea to work in Germany when he was with the RIT Formula SAE (Society of Automotive Engineers) Racing Team at an international competition the team attends annually in Germany. Each year, the team builds a car from the ground up.